These flowers did double duty for a weekend long wedding celebration here in Sheridan, WY. 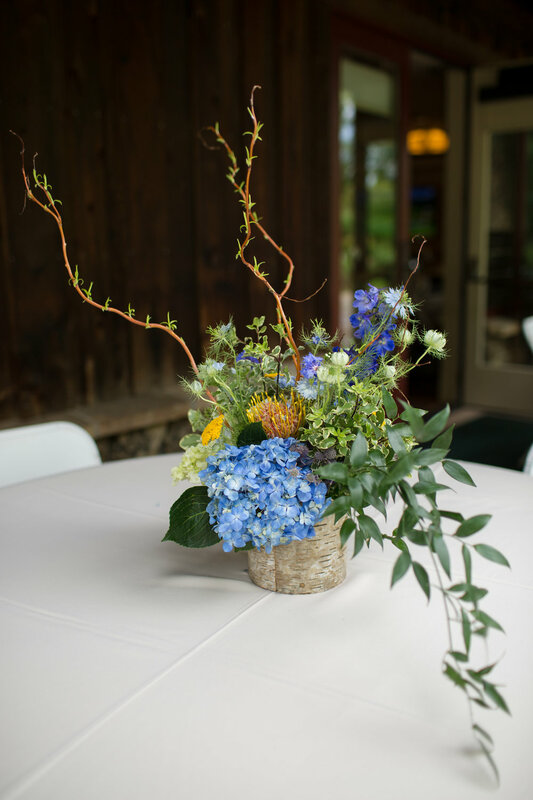 The entire weekend was coordinated by the talented ladies from Cloud 9 Wedding Planners from Denver, CO and they helped us pull these events off without a hitch. 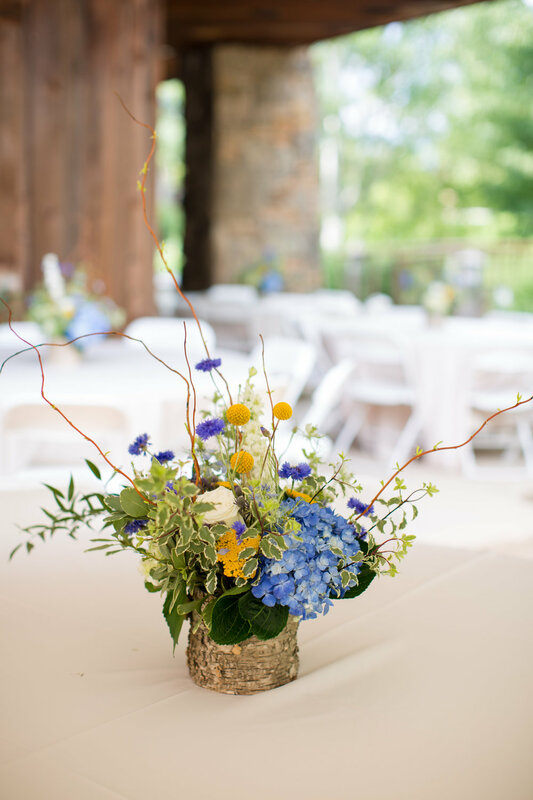 The talented Alissa Ferullo Photography captured the details beautifully! 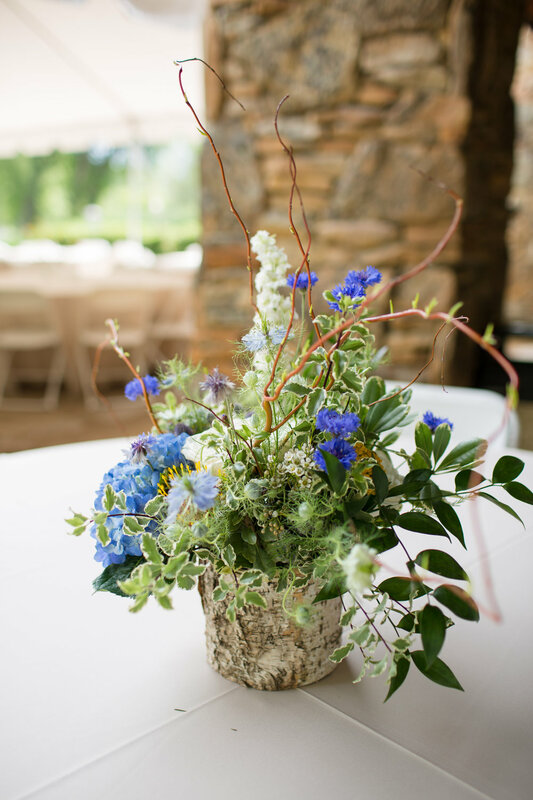 We started with rustic birch containers filled with textured, variegated greenery, curly willow and flowers in shades of blue and white. The moody weather on a Thursday evening at the Big Horn Equestrian Center provided the perfect backdrop for the rehearsal dinner provided by Kiwi Catering. After the guests moved onto their next party, we returned to collect the pieces for a refresh at the studio. 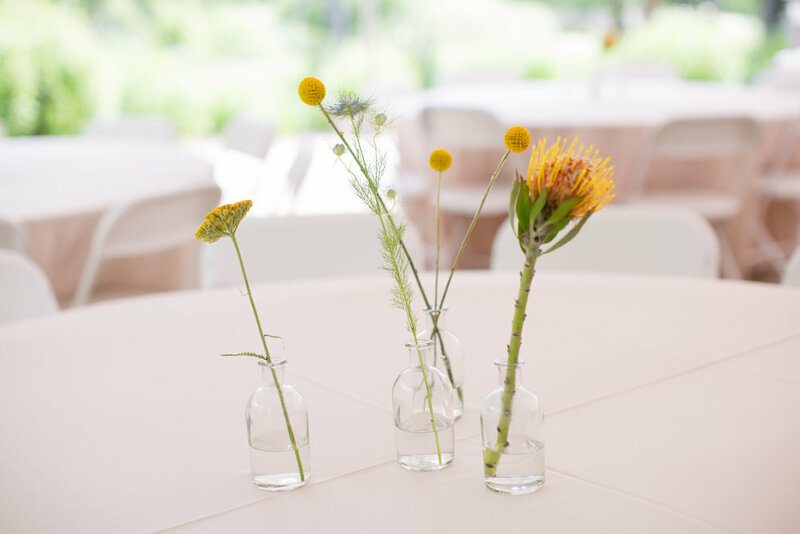 They made a new appearance a few days later with bright pops of yellow added for the wedding day brunch hosted at the Powder Horn Country Club. 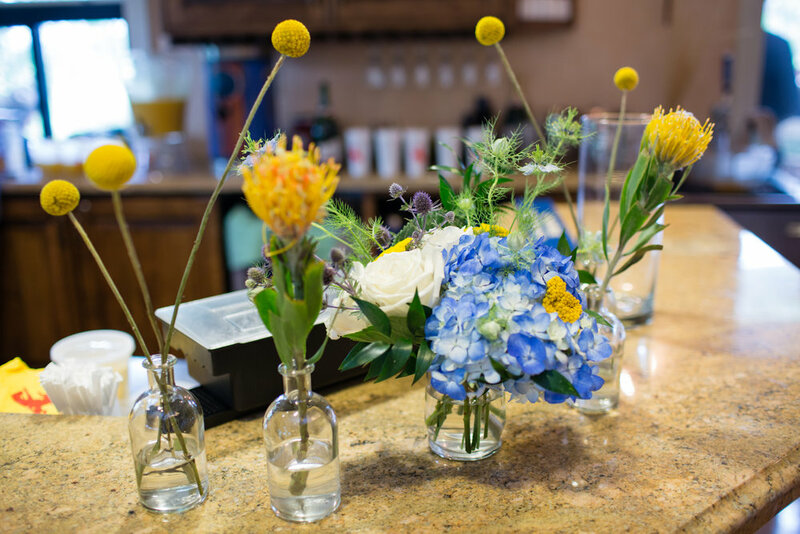 We mixed the arrangements with a series of fun bottles using the same colors and flowers to fill up the room. Congratulations - You're planning a wedding, I'm here to help! Planning a wedding is a big undertaking and not something most people do every day. Amidst the joy and excitement that comes with an engagement, you’re inundated with dozens of decisions and choices. From the small to the large, you’re trying to fit the pieces together to shape your best day and the beginning of a new life with the one you love. I intend to make the flower portion of planning easy, stress free and of course deliver an absolutely gorgeous final product on your wedding day. Whether you’re planning an intimate elopement or a giant party, I’d love to be a part of your celebration. Full Service for medium to large weddings which includes delivery of personal flowers prior to photos and complete setup of ceremony and reception flowers. Teardown option is available following your party. Here’s a quick overview of the Whirly Girl process. Reach out - Complete this form, give me a call or drop a DM on instagram or facebook to get the conversation started. Providing your date up front allows me to confirm availability first thing. Information collection - Once I confirm availability, we’ll start with some wedding basics which you can provide via this questionnaire. It’s helpful to know your color scheme and flower wish list along with your anticipated wedding part size, number of guests and budget. You may not have answers to all these items (or they might change as planning goes forward) but simply provide your best guess to get started. Are you using Pinterest to collect some inspiration? Great! Please be sure to add me to your board (or include a link) so I can see what you’re dreaming about. Estimate - After reviewing your information I’ll provide a basic estimate for you to review. I typically provide one estimate with a basic visual proposal prior to booking with a one week expiration. If necessary, we can make one revision prior to booking. Once accepted, I’ll provide a contract for review and deposit details. Booking - Yay! you want to work with Whirly Girl for your wedding. Return the signed contract and deposit. We’ll make time to chat, discuss options in detail and nail down specifics. I’ll also provide a schedule so you know what to expect from Whirly Girl in the coming months in order to make your flower dreams come true.